Stay up to date with Analgesic Productions on Twitter or through our newsletter! After the previous devlog, we continued work on the demo. We set up the animations for Nova's character, as previously she only had a idle animation. I also took the time to fix some controls issues. One of the biggest progresses was we created the intro area and finished the art and layout for it, minus a few cutscene things. I showed it on Twitter, it's called The Albumenium. If you'd like to see an animated version, go here. 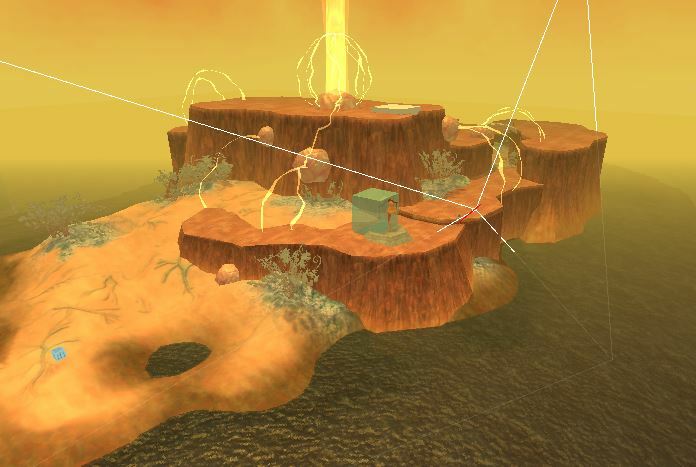 In the process of creating this, we learned some things about 3D level design as well as the art process for 3D areas. The area plays an important role in the beginning of the story but we'll leave exactly how for the main game! Some main characters also received 3D models and color blocking. I also have worked on a bunch more songs for the beginning areas of the game! There was a character who had a complicated relationship to Nova. This character was also related to a certain currency you obtain in the game, codename CG. It was hard to express this relationship in the context of Anodyne 2 without feeling too distracting to the main game or making it feel like the game had 'story bombs' at certain points where too much info was dropped. An alternative we thought of - removing that CG currency and splitting up these story sections and moving them elsewhere in the game - was workable, but likely more confusing to follow, and required planning more things the player was forced to see. This goes against the exploratory free roam feel we wanted in the 3D sections. It also would make the game sort of vague, confusing, while still having lots of cutscenes to pull you out of the main progression of the game... without clearing up that vagueness! This lead to also removing this other gameplay story mechanic, because the removal of the CG stuff meant we didn't need this story mechanic. So now the game still had the character but the role was different. However now this character was basically pointless, so we cut it out. However there was a character development in Nova that needed to be expressed, but we were able to utilize these items you obtain in the game to aid in that development, which is nice to have those items better integrated into the story. The past few days I've been busy with dealing with some stuff for Anodyne on consoles! I cannot speak details, but expect exciting news soon. Continue working on the demo for business reasons. Note that this probably isn't going to be a public demo.